What Are The Best Longboards & Skateboards For Beginners 2017? Buyers' Guide! Longboarding is SUPER FUN! As a beginner, you would surely smack it, stumble upon and return home with sore elbows and knees! Therefore, it is important the best longboard or a skateboard whichever you prefer. Now there are many longboards and skateboards available in the market to confuse you. Each of them got looks and features amazing enough to make your decision making even harder. 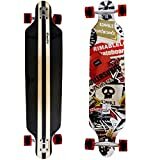 So first thing first, I am going to share how you as a beginner can choose the best starter skateboard and longboard. This Yocaher longboard is counted among the best longboards for beginners for being fast, stable and smooth. It can make those sharp turns at high speed, but effortlessly. The deck is unique – lowered in the middle keeping the center of gravity low. The concave deck ensures that the riders' foot is totally locked in and is easier to switch over without turning the entire board. Not only it looks tough, but is with zinc plating color it is rust-resistant. 41.25-inch long, 9-inch wide and 5-inch height – easy-to-control. Made of 9 Canadian maple ply hardwood – weighing 8.2 pounds. ABEC7 chrome bearing, 180mm hanger, 78A 70x52mm Q-Ball wheels. HD7 Heavy Duty aluminum trucks. 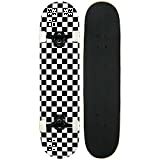 Black grip tape of finest grade 80A for excellent grip. Stylish, stable, good balance – just right for beginner longboard riders. Compact and thick structure along with attractive graphics. Available in a wide range of color according to varying customers' tastes. Wheels are stable, hard and perfect for learners. Safe and secure for downhill cruising. Supports tight turns at a high-speed. Supports up to 240 pounds. Perfect for both professionals and novices. Available at a very low price. The bearings are found to stiff initially– will loosen up later. The gears including truck, wheels need to be adjusted according to the riders' taste. Thicker board structure leads to less flex. Why Should You Consider Yocaher Professional Speed Drop Down Stained Complete Longboard? Effortless Riding – The Yocaher Longboard is low in the centre. Low centre of gravity and the concave curvature hold the rider stable. The deck is hard enough to provide stability even at top speed. It features soft wheels, providing you with a smooth and effortless ride. Premium Bearings and Wheels – The performance of the wheels extremely depends on the bearing used. It includes premium quality ABEC7 chrome bearings adding to its life while giving it a smooth motion. The Q-Ball wheels with a hardness level of 78A are exceptionally good maintaining your balance at a high-speed. Ideal for Beginners & Professionals – It is designed for advanced level longboard riders, but even beginners can use it glibly. It can bear up to 240 pounds and rides downhill at a speed of 35 miles/hour. Recommendation – To give a figure, this Yocaher board has earned 4 stars out of 5 with around 74% positive reviews. Atom Drop Through Longboard has become one of the best longboards for beginners with some real vigor. It has an ideal length of 40 inches. Boon, the lightweight and strength, flex of the deck, all has contributed to make it much loved. Made of 7-ply maple and 2-ply bamboo. Photo heat transfer graphic of Tiki-style. 180mm hangers, navigator drone 40 degrees base. Atom AREA 51 wheels with 70mm diameter and 51mm wide with 78A SHR. ABEC9 bearings with high-speed lubricant. Supports up to 275 pounds. 40-inch long, 10-inch wide – optimum size. Suitable for any kind of riding style, especially carving and cruising. With soft wheels and small angle trucks it is one of the best longboards for beginners. It is not easy on the pocket, but you get quality for the price you pay. You may need to replace the bearing for a faster performance. The deck is made of 7 layers of maple and only 2 layers of bamboo contributing to its limited flex. It got a bit loose grip in comparison to the ideal one. Why Should You Consider Atom Drop Through Longboard (40 Inch) ? Durability – As a mix of bamboo and maple, this board is meant to last longer which means you are going to do a lot of longboarding. Style – It may not impress all the longboards enthusiasts, but it has some style to die for. The eye-catching heat transferring graphic is going to turn many heads around. Strength – Seven layers of maple add to the strength while two layers of bamboo include its own share of strength and distinctive flex. Handling – The drop through longboard comes with very tight trucks. Just loosen them a bit, and you are go to make those turns. Comfort – The dimension of the deck is neither too short nor too long, just perfect for a tyro. Even people with biggest feet can go cruising comfortably. It is 10-inch wide with an outstanding grip. 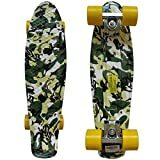 Recommendation – This Atom Longboard is not the most inexpensive, but it is worth it. It has earned 4.7 stars with 79% customers rewarding it a sweeping 5 stars. This mid-level longboard is definitely one of the best longboards for beginners. Having doubts? Check out the ratio between its price and features. SIZE MATTERS our 44" Longboard is the perfect size constructed in a Multi-ply Hardwood Maple and beautiful artisan bamboo deck shaped to perform and the extra detail rarely found at this price. THE ORIGINAL BAMBOO LONGBOARD - Designed on the boardwalks in California to higher specifications from Malibu to San Diego, we are the leaders in longboard and skateboard. DARE TO COMPARE Not all longboards are the same, Quest longboards are made with better materials and components if you are looking for a pro style longboard at a great price. look no further. MADE IN MARS- We design and make nearly 100% of our own product. The best of the tradition brands, working with some of the real pioneers of the Skate, Surf and Snow Board world, help reinvent them using today's best components, great fresh art and new technology. This longboard is a fantastic eco-friendly way to glide across the city. It got wonderful features including the best deck available in the market, lightweight, ease of control, maneuverability, stability. 44-inch long, 10-inch wide, 5.5-inch high. Made of 5 Maple wood ply. Artisan bamboo design and abstract graphics. Rugged 7-inch aluminum trucks are lightweight. Durable 80A 70mm Polyurethane (PU) wheels. ABEC5 bearing and 4mm hollow risers. Kick tail shape – ideal for downhill riding and cruising. Comes at a really low price. Easy-to-control over rugged surface – suitable for downhill. Stylish deck with artisan bamboo finish. Sturdy and lightweight trucks are stable. Cannot turn in full radius. Some find the trucks heavy. It comes with ABEC 5 bearings. Some recommend changing them for better performance. Why Should You Consider Quest Super Cruiser Longboard? Deck – The lightweight deck is 44 inches long giving you enough room to be comfortable cruising and taking those incredible turns. Skate with no restrictions. Ideal for cruising – This Quest Longboard Skateboard is ideal for cruising, downhill as well as freeriding. The deck's shape and width make you feel stable and comfortable. Further, it is smooth and reliable – just what you need to cruise around. Design – Look-wise, this longboard is really appealing. Every rider who rode it praises its design and awesome performance. The abstract geometric bamboo deck design is stylishly grand. Though it's colorful, but the simple colors make it more striking. Suitable for all – Whether you ride for relaxation or pleasure, this is a fantastic longboard for every rider with different skill levels. Its features and performances match everyone's taste. Movement – Being so easy-to-control and maneuver, it is advantageous to beginners. Boon, it is smooth and stable, minimizing strain on knees and ankles. Wheels – The Skateboard comes with tough 70x51mm polyurethane wheels along with 7-inch aluminum trucks. Being lightweight and strong, it prevents 'wheel bites'. Recommendation – It has earned over 4.5 stars with more than 50% customers giving it full marks of 5 stars. Isn't that incredible? This classic pintail longboard from the Atom Longboard is a super-smooth and stable starter's ride appropriate for cruising, carving even at a high speed. 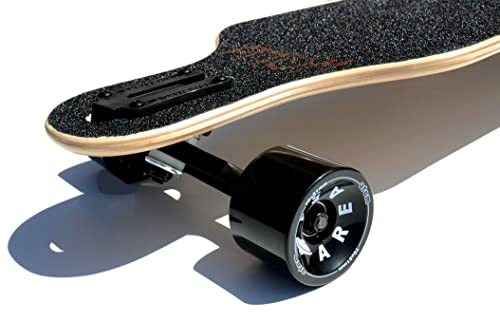 The biggest advantage of the deck shape is its "no wheel bite" guarantee. It is an excellent amalgamation of quality, look, speed and performance at a very affordable price. 39-inch long, 9.4-inch wide, 6-inch high. Made of sturdy Maple laminate. Comes in classic pintail shape that guarantees no while-bite. 8.5-inch Aluminum trucks, ABEC5 bearings, 65mm Urethane wheels. Lightweight – 7.3 pounds only. Ideal for cruising and carving. Ideal from cruising, carving, downhill riding. Stable and secure at high speed. Versatile and consistent ride from beginners to pro riders. Taking sharp turns is a breeze. High quality at pocket-friendly price tag. Bright graphics – looks wonderful. Being 7 pounds, it is heavy to carry it far-off, but cruising it is good. Strenuous use would drop the trucks and bearings. Requires proper and regular maintenance. Why Should You Consider Atom Pintail Longboard? Shape – This Atom Longboard comes in a pintail shape which itself is a no wheel-bite guarantee. Apart from that it also facilitates while carving in a tight radius. Durability – It is made of Maple laminate which is globally known for its strength. It is not going to slump, no matter how many times you crash. It is going to accompany you for years. Wheels and Bearings – The 65mm urethane wheels come with a hardness rating of 78A, very stable and reliable for cruising at high speeds. The ABEC5 bearings are smooth and consistent. Together they lift up your self-confidence and pace. 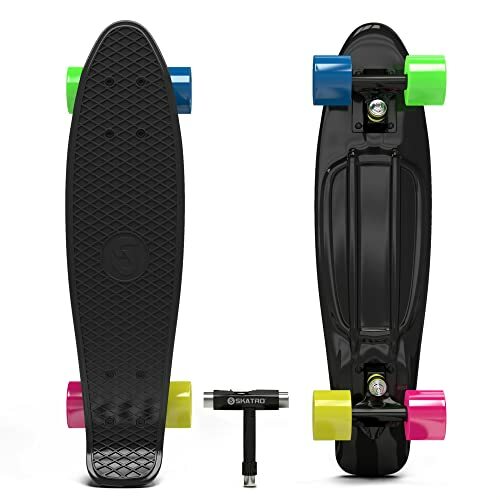 Ideal for cruising and carving – Besides the premium trucks and wheels, the classic shape of the longboard assist in cruising around without wheel lock or bite issues. Further the deck is stiff, which reduces stress on your knee-joints. Ideal for every rider – Both newbie and experienced riders, would appreciate riding this board. Not just, it is speedy, but also stable. Even an intermediate rider can enjoy a safe downhill ride. Recommendation – It got 4.4 stars on Amazon with more than 63% of satisfied customers giving it their support, and recommendation as full 5 stars. 41X9.5 Inch Size With Freerider Shape longboard! 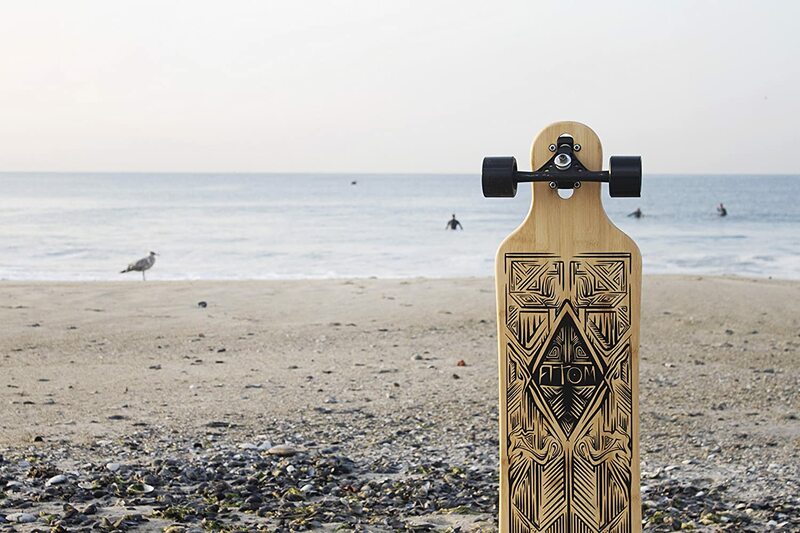 The manufacturer got a small collection as compared to the other brands and Rimable Drop-Through longboard is one such beautifully crafted longboard that suits different riding styles from cruising, carving to freestyle riding. Whether it is comfort, stability, maneuverability, quality, speed, or performance, this ride is genius! Made of 9-ply of sturdy Maple laminate. Drop-through deck with low center of gravity – good for sharp turnings. 7-inch 180 aluminum trucks, 70mm 85A PU wheels, ABEC11 bearings. Ideal for cruising, carving, freeride, freestyle and downhill riding. It is strong and stable –ideal for anyone to start learning longboarding on. Made of strong 9-ply of Maple laminate – can stand heavy-weight riders. High-quality bearings, trucks, wheels – easy-to-balance, maneuver. Smooth and stable at high speed. The trucks are tight – you may need to loosen them a bit according to your preference. Some complaint that the wheels get soiled pretty fast. Why Should You Consider Rimable Drop-Through Longboard? 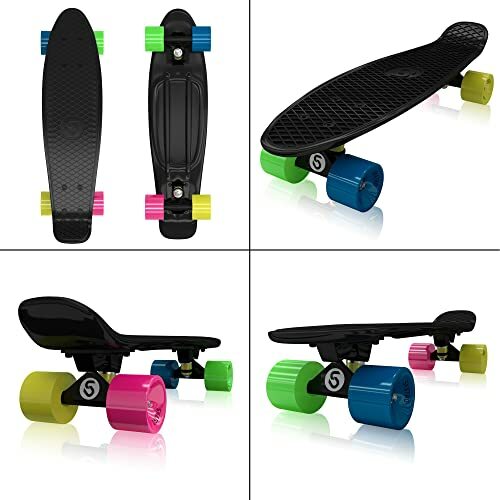 Single board for all riding styles – There are several riding styles in longboarding and each of the riding styles require different boards with different features. Only a few longboards are there that are suitable for all kind of riding styles. Rimable Drop-Through longboard is one such ride. Durability – The deck is made of 9 layers of Maple laminate. Wheels got 85A hardness rating whereas the bearings are ABEC11. The manufacturer has used only high quality parts in this board so it gives the rider the best adventure without braking or melting down. Maneuverability and Stability – The size of the longboard is ideal for speedy rides. It is easy-to-maneuver and stable while taking those quick turnings. With high quality trucks, wheels and bearings, the risk of falling off the longboard is reduced to little. Ideal for Beginners – For a beginner, it is important that ride is stable, comfortable and doesn't fall apart after crashing a few times. It is highly recommended on those basis. Recommendation- Most of the customers love this ride. No doubt it scored 4.4 stars on Amazon with 68% of the customers giving it 5 stars. This KPC Pro Complete Skateboard is gorgeous to look at and well-recommended to start riding on. Despite of your abusive treatment, it is not going to hurl over. It is available in several amazing and bright colors to suit riders' differing tastes. It got a sturdy construction and ready-to-roll ahead. 31.5-inch long, 7.75-inch wide deck is made of 7-plies of Canadian Maple . Comes in a wide range of colorful graphics. Includes premium 52mm 99A Krown Graphic wheels, metal trucks, ABEC5 bearings. Ideal for riders from all age groups. Standard-sized board for both children and adult. Quality hardware for smooth riding experience. Easy to control – ideal for beginners. Ideal for cruising, carving, performing tricks. Grip tape can come off if used haphazardly. Why Should You Consider KPC Pro Skateboard Complete? Smooth and Stable – The deck is wide enough to accommodate the rider's foot comfortably adding to its stability. The Krown Graphic wheels are small, but really hard. ABEC5 bearings, aluminum trucks are of superior quality. All ensure stability and smoothest riding experience. Sturdy Construction – The deck is made of 7 plies of Maple Laminate. From bushings to the trucks, each of the parts are of high-quality and meant to last long. 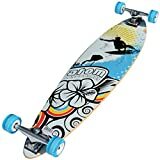 Ideal for Beginner – It got a design of a pro skateboard with all the features to support the learning days of a beginner. Handy – It is a lightweight skateboard with a standard size. Whether it is about performing tricks or riding around the campus or carrying it to somewhere; it is pretty handy. Recommendation – It got a decent 4.1 stars on Amazon with 61% customers giving it their unconditional love and support in the form of 5 stars. Rimable is gaining fame for its high-quality excellent rides. Rimable Complete 22-inch Skateboard is one such cool skateboard. Whether a commuter, cruiser or a beginner, it is popular among all. Not just it is great to look at, but all fun and thrilling to ride on. 22-inch long, 6-inch wide deck is made of strong plastic. It comes complete with 3" aluminum trucks, 59mm 78A PU wheels, ABEC7 bearings. Stylish and attractive – available in 23 bright colorful graphics. Extremely lightweight (4 lbs) – handy. Supports up to 198 lbs. Lightweight and compact – easier to carry. Durable making – with better control for smoothest ride. Designed as a family ride - from starters to experts. Got a kicktail - perfect for cruising, sliding, performing tricks, or going around barefooted just for fun. Amazing quality at an affordable price. Some customers are upset as the wheels get bad pretty fast. Doesn't ride that smooth on rugged and pebbly surface. Some also complaint that the paint come off after a few rides. Why Should You Consider Rimable Complete Skateboard? Maneuverability – The plastic deck got nice flex and pop enough for a controlled and smooth ride. Just a push, and it rolls ahead effortlessly. It slides smoothly at all speeds. Better Control & Stability - On one hand it got speed-friendly bearings and on other hand it got soft and stable wheels that gives better control. Premium quality aluminum trucks keeps the ride stable even at high speed. Ideal for Beginners – It got a durable construction with better control and stability. Can support riders weighing up to 198 lbs. It is considered for all ages from expert riders to kids just starting off. Recommendation – It got a decent 4.3 stars on Amazon with a majority of 69% purchasers giving it a thumps up. the count of customers reviews confirms that it is not just the best skateboard for beginners but also very popular. This Powell Golden Dragon skateboard is an amazing and rightly the best skateboard for beginners for several reasons. This well-built skateboard is stable, durable, attractive and affordable. What else to ask for? 31.625-inch long, 7.625-inch wide along with a wheel base of 13.75-inch. PGD deck with Maple veneer and screen-printed graphic designs – attractive and good traction. Includes 54mm 99A PGD SHR polyurethane wheels, 7.63-inch cast aluminum Golden Dragon trucks, ABEC7 bearings – nice grip and smooth rolling. Best skateboard for beginners at an entry-level price. Hard PU wheels – fast and smooth. Factory-tested parts used – quality ensured. Comes with an instructional CD teaching the basics! Ideal for kids to adult, beginners to professionals. The wheels are on harder side for a beginner – recommended to replace them with softer ones. A few complained that the grip tape peels off earlier than expected. Why Should You Consider Powell Golden Dragon Flying Dragon Complete Skateboard? Durable – The PGD deck is standard with curved up ends but considering its lightweight, it is definitely very durable. All the parts used in the skateboard is factory-tested for durability and quality. Fast and Smooth – The trucks are pretty impressive for the price but make require to be fine-tuned a little. The wheels come with a hardness level of 99A and roll smoothly, making it ideal for tricks. Ideal for Children and Adults – It is a high-quality reasonably priced board with a weight support limit of up to 200 lbs. Whether it is for you or your kid; it would be a perfect ride for everyone. Ideal for Beginners – It rolls really fast. Therefore it is recommended to replace the replace the wheels for a softer one for extra grip and stability. The grip tape is extremely grippy and stable – doesn't let you slide off the board. All these are vital features that makes it the best starter skateboard. Recommendation – Unsurprisingly, 73% customers gave it 5 stars, which defines their love for it. It has got a swooping 4.6 stars on Amazon. Still, need to know why we recommend it as one of the best skateboard for beginners? This Skatro Skateboard is sturdy, trendy and quality. Skatro has been really fussy about their design and performance so decided not to rely on other manufacturers for their components. Considering its performance, feature, longevity, and look it is one of the best longboards for beginners. Made of quality injection mould plastic. Parts – 59mm Urethane Skatro wheels, ABEC7 Skatro bearings, 3-inch lightweight aluminum trucks. Made using Skatro Flexy Technology ensuring optimal flex. A color matching T-tool worth $10 comes with every mini cruiser skateboard. Made of injection mould plastic weighing only 4.7 pounds. Stylish look that appears much like a penny boards. Easy to ride and carry anywhere. Skatro Flexy Technology ensures excellent performance without a bump. Light and easy-to-carry – ideal for beginners. 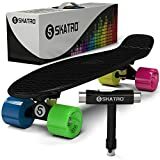 Why Should You Consider Skatro – Mini Cruiser Skateboard? Value – It performs far better than several top brands costing hundred bucks. Whereas this board comes only at a fraction of it . Exceptional flex – Every board is made with Skatro Flexy Technology, a patented manufacturing process that works just like a car suspension absorbing bumps. It ensures quality ride. 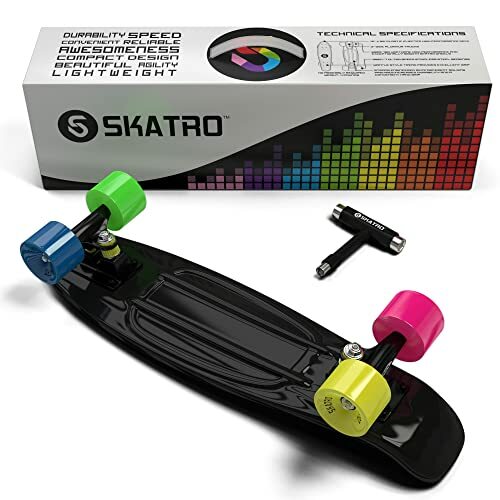 Excellent performance – All the parts of this mini cruiser skateboard are manufactured by Skatro only – nothing outsourced. As a result everything runs in a complete sync and performs exceptionally. Easy-to-carry - It is a compact and lightweight board that you can stuff into your backpack and carry it anywhere you like. Amazing design – It comes in amazing bright colors that are surely going to stun the onlookers. There is nothing you can do about it. Ideal for beginners - The insignificant weight, compact size, ease to carry and maneuver, magnificent flex has made it one of the best skateboard for beginners. Anyone learning the basic would find it really useful. Recommendation – It got 4.8 stars with 91% of customers giving their love, appreciation and recommendation in disguise of 5 stars. The insignificant weight, compact size, ease to carry and maneuver, magnificent flex has made it one of the best skateboards for beginners. Anyone learning the basic would find it really useful. It is one of the best-selling skateboards available in the market. If you are looking for the best skateboards for beginners, don't miss Penny Graphic Complete Skateboard's candidacy. It got a perfect size, ideal for riders with any level of expertise. 22-inch long, 7.5-inch wide - perfect for newbie. Comes in a wide range of colors and graphic series. Components include 3.125 Penny trucks, ABEC7 bearing with standard hardware, 78A Penny wheels measuring 59mm. The design and graphics bring out the carefree wild side of you. Suitable for riders with varying skill levels. Small and compact design is easy-to-carry anywhere. Rides smoothly on uneven surfaces. Stable and smooth rides – suitable for beginners. Smooth turn even in a small radius. Paint at the bottom may flake out. The grip tape isn't included. Small size makes it tricky to do the tricks. Why Should You Consider Penny Graphic Complete Skateboard? Design - This Penny board got a vintage design that would take you back in the 1970s' when skateboards were first built. It looks stunning and "CLASSIC". Further, it is quite small and compact – a perfect mini cruiser skateboard. Rides smoothly – It features soft wheels allowing you to ride smoothly on any kind of surface. Handy - Apart from all its features, it is one classic design that fits any place whether you are going to surf or school, or in public transport. It not only fits into your style, but also in backpack and lockers. Maneuverability – Being compact and lightweight, it is easy-to-control. No matter, how narrow the pavement is where you are skating, it makes the quick turns even a tight radius. You can easily experiment with various riding styles at varying speeds. You are free to have some fun and thrill for sure. Durability – You can expect this mini cruiser skateboard to last for many years. Recommendation – Undoubtedly everyone loves Penny Graphic Complete Skateboard. Otherwise, how could it earn 4.8 stars with 829 positive reviews. And, it is still counting. 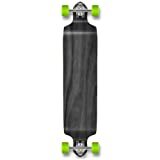 Not only you know the basics of how to pick the best longboards for beginners and the best starter skaterboard also you have the top rides reviewed. Hopefully now you can easily pick your favorite ride! So which one is your personal favorite? What Do You Mean By the Best Longboards for Beginners? There is no hard and fast rule, of which board will be RIGHT for you! Whether you a getting a complete board or assembling it yourself, you must know the different parts of your ride, how they work together to give you the best riding experience and how can you pick the best one. Why & How To Choose the Best Longboards for Beginners? It is not advisable for a newbie to assemble or customize a ride. It is time to get used to longboarding, get comfortable, learn the basics and then develop preferences. Then it would be wise to customize your ride! Remember, as a beginner you need to be relaxed, as an intermediate you need to get active and fast in the advanced level. Accordingly, you need to choose the perfect ride with all the suitable features. A. Shape. Shape. There are different shapes for every riding style with some overlapping. The last call is your personal preference. However, it gets to go for a longboard with no kickflip. It would be more stable with a larger wheelbase. Cruising Cruiser, pintail, bamboo, drop-down as well as drop-through. Downhill Cruiser, top-mount, speed board. Pro tip: Go for cruiser or pintail or a drop-down board. B. Deck. It is the plank you stand on while riding. It is generally made of several layers of wood. Nowadays, these decks are even made of plastic. The flexibility of the deck is very important as it absorbs shock and makes you stable. But remember, if you want speed, you need to let go of flex. So try to avoid the stiff ones. Soft to medium soft would be ideal. Check out the material combination of the deck and go for a flat deck or one with a bit of arc. Again pick one with the wider deck that suits your riding style. It distributes your bodyweight evenly over the board and stabilizes you, and gives your plenty of legroom to be comfortable, which is very important and helpful for a novice in the initial days. · 8.25" and more – Ideal for cruising, skating pools and traditional longboarding/skateboarding. · 8" t0 8.25" – Ideal for riding in the skating parks, ramps and pools. · 7.5" to 8" – These are standard rides for adult and expert riders performing tricks. Pro Tip: Go for a wider deck either flat or with a slight comber. C. Trucks. A skateboard requires two T-shaped metal units that fasten the wheels to the board. There are several parts of the trucks like the kingpin, hanger, and axle. Another important thing to consider is the truck profile which is the distance between the hanger and the bottom of the deck. The low truck profile is ideal for small 50 to 53mm wheels. The mid-sized truck profile is an all-rounder and goes nicely with mid-sized 53 to 56mm wheels. However high trucks wheels are recommended for large wheels and good for cruising and carving. Don't miss the detailed buying guide and reviews of the b﻿est longb﻿oard skateboard trucks. Pro Tip: Go for trucks with mid-sized profile and axle width close to that of the deck. D. Wheels. A ride requires four wheels. There are several options with differing sizes, material, durability, and colors. The most important features to consider about are material, diameter and durometer reading in respect to the riders' personal riding style preference. Diameter is measured in millimeters and smaller the diameter means smaller the size of the wheels. Remember; bigger wheels are more fast and stable than the smaller ones. Durometer is the hardness of the wheels measured between 1 to 100 on Durometer A and B scales. Measurement on b scale is 20 points lower than a scale. Lower the durometer measurement, softer the wheels are. Hard wheels give you speed, but if you need grip (essential in the early learning days) you need softer wheels. Pro Tip: Go for bigger wheels but with an appropriate hardness that can support your body weight. Don't miss the detailed buying guide and reviews on the best longboard skateboard wheels﻿﻿﻿. E. Bearings. Bearings play a crucial role in the overall performance of the wheels. They are the small round pieces made of metal that fasten the wheels with the trucks. Size isn't important for choosing the right bearing. What is important is the quality and precision which is signified by the ABEC rating. A golden rule is that higher the ABEC ratings, premium would be the quality. They are available in ABEC 1, 3, 5, 7 and 9 rating. If you have ABEC 9 rated bearings, they are going to have a faster ride with least of friction. Pro Tip: Don't go for a bargain. Premium quality bearings could be expensive, but they worth every dime of it. Don't miss out the detailed best bearing buying guide. F. Risers. As the name suggests, this flat plastic-made hardware is meant to mount the trucks to the decks. It increases the space between the wheels and the decks so that the riders don't experience any wheel bites while taking sharp turns it extends the life of your ride. Generally boards with smaller wheels (smaller than 55mm) need no risers. They come in various sizes and colors. Generally, the longboard/skateboard hardware set includes 8 pieces of locknuts and bolts. But you need to consider the sizes and lengths of the riser pads and hardware before buying them. Pro Tip: If you want bigger wheels get risers to prevent the frequent wheel bites. G. Grip tape. It is coarse material much similar to a sandpaper with adhesive top pasted on the deck. It helps the rider to have a nice grip over the longboard deck while performing the tricks. It is available in several styles, patterns and colors to suit the personal style of the riders. Pro Tip : It is also available in single sheets. You need to peel the old grip tape and then paste the new one. The with a cutter or razor blade, cut the excess off. Now you know what makes a longboard best and ideal for a beginner rider. You know what is best for you from the shape and flex of the deck, to the wheels' durometer. Still there are so many options out there – both amazing and confusing! That's why we have shortlisted the top 5 of the best longboards for beginners and started skateboards fully reviewed for you. Consider the features you are looking for. Find out if the board matches your criteria. Think and assess which one is going to work for you better. Once you get a hold on what you are seeking, just get ready to kick the ground! Get Best Longboard & Skateboards - Cyber Monday in 2016 Star Now! Copyright Top Sports Brands - 2014 - . All rights reserved.